If you follow my Instagram, you may have seen that we had one of my favorite dinners on Friday night, and as promised..here is the full report! I don't know where my love of hot dogs began, but I know it really set in when we were living in Chicago and going to Cubs games at least weekly. They had the MOST amazing hot dogs at Wrigley field. I am always on the lookout for a great dog, and I often can't have just one. Example..here, at Pink's in Vegas a few years ago. Where, by the way, they also serve jello shots. Just FYI. Several weeks back, I posted about how much I was looking forward to summer and grilling out season, and all the sudden it arrived! Once I realized the beginnings of summer were upon us, I decided that we needed to kick it off with a bang - a hot dog party, immediately! So on Friday morning I texted Matt and said "clear your schedule...hot dogs tonight." And then I watched the clock the rest of the day. Trent was in the spirit, too, even though the action didn't start until after his bedtime. Because it was very impromptu and just the two of us, I tried to limit the toppings so we wouldn't have a ton of food leftover, but choosing which dogs I wanted proved harder than I thought. Ultimately I settled on a quasi-Chicago dog, a Cobb salad dog (to make use of the leftovers from the night before), a "Texas" dog (Matt's name...it was really more of a Tex-Mex dog) and a BLT dog. Sauces/condiments are my weakness, so I brought out just about everything I could find..and I think we actually used them all. The Nutella, whipped cream, chocolate syrup and sprinkles were for the dessert banana hot dogs which didn't get photographed somehow...what?? Guess we will just have to have them again asap. PS how cute is the little patriotic hot dog DOG on the bar? I waited (impatiently) for him to go on sale for MONTHS, and it was so worth it. Then it was time for drinks. We love candy in this house..almost as much as we love margaritas. So I decided we needed both. I felt slightly bad impaling the gummy bears but quickly got over it once I saw how cute they were hanging out in my drink. We had these straws left over from our baby shower BBQ last summer, and I decided to dress them up a bit for the occasion. Finally....the hot dogs! When I was pregnant I was missing hot dogs almost as much as I was missing a good night's sleep, so I was beyond excited when my sister-in-law, Renee, brought me these nitrate-free Angus hot dogs. They are still my favorite even now. Matt got some different kinds of chicken sausages from Market Street, and we grilled up way more than we could possibly eat. I went for a Cobb dog with all the fixins followed by a plain dog with mayo and ketchup. And I have to say...as much as I love all the fancy schmancy hot dogs and creative toppings, I still think there is nothing better than traditional. Just call me old-fashioned. We threw in some Sun Chips, of course, and chowed down. One last quick tip before I head out. For some reason, our neighborhood is like fly central. There are so many flies. We have tried a ton of things, and this is by far the best at keeping the flies away. Just slice a lemon, stick some whole cloves in, scatter the slices around the table, bar, back yard, etc...and I kid you not, no flies. I could not BELIEVE how well it worked. I was totally skeptical, but Matt insisted that we try it..and I have to say he proved me wrong 1000%. And they can actually look pretty, too, as opposed to some of the other contraptions out there. Perfect for a summer party or wedding! I am already craving some dogs again. 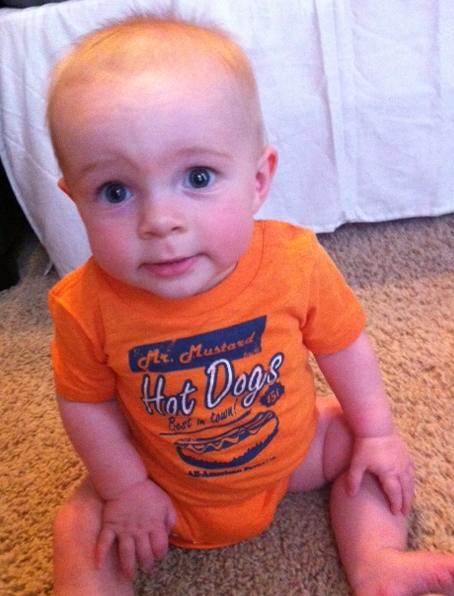 We are headed to my parents for Father's Day this afternoon, and of course I already put in my hot dog request. Hope everyone has a great Sunday and end to their Father's Day weekend! Up next...weekend recap with several firsts for Trent Fox. This entry was posted on Sunday, June 16, 2013. You can follow any responses to this entry through the RSS 2.0. You can leave a response.